Supra United Soccer Club In-House Soccer Program is a Recreational program intended to provide youth players (boys and girls) from 4 to 18 with the opportunity to play in an appropriate environment. The focus of recreational soccer is toward participation and fun over competition. Recreational soccer is a learning program. As such, each player plays at least half of each game except for reasons of illness, injury or discipline. Since 2006 Supra United Soccer Club adopted a house league program for the players born 1998 to 2005 . This program was developted in Brazil and has been played there for many years. 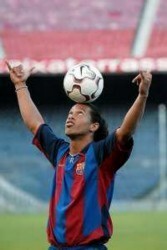 Ronaldinho , a brazilian soccer star playing for Barcelona in Spain , credits this format for his ability to move the ball and his fast thinking on the field. *In-House Soccer is intended to be a noncompetitive FUN learning environment for the children. *Players and Parents are to be on opposite sides of the field. *No Scores, standings, or records are kept for In-House Soccer. *Referees if present are not to be approached or spoken to by anyone but the team coach. *Players and coaches are to shake hands at the end of each game. *Each player shall have a uniform of the team color provided by the Club , that is to remain tucked in during the game. Sweats and long sleeves may be worn under the uniform. *Each Player Must wear shin guards for both games and practices. *Appropriate Shoes - soccer cleats are suggested but not required at U6-U10 levels. *Eyeglasses should be secured with an elastic holder or strap. *Players may not wear hats during a game. *Players may not wear jewelry of any type during a game or practice. *The goalkeeper shall wear colors which shall be different than the two teams colors. Supra United Soccer Club is pleased to come into a partnership with the Metro Police 13 Division for a community run soccer program . This house league program is supported by the Metro Police 13 Division Community Partnership and is designed to get full community involvement in the soccer program which is being kick started by Supra United Soccer Club. Our goal is to get the kids off the street and into a soccer program which is affordable to everyone regardless of race , colour or creed . Involvement of the parents is crucial for the programs success and the well being of the kids , if the players see the parents get involved in the community , they too will grow up and will become involved in their community . Volunteer 2 to 3 hours a week , we need coaches for this program to replace the competitive team coaches who are helping to kick start this program in your community , we also need referees , team managers , assistant coaches , lets all do our part for this program to be a success for the community and Supra United Soccer Club . ** House league coaches Some knowledge of soccer required , training provided by our Technical Director. Training equipment provided by the Club. ** Referees Basic knowledge of rules required , training provided by our Ontario Soccer Association certified Club referee. Uniform supplied by the Club. LETS ALL WORK TOGETHER TO MAKE THIS THE BEST COMMUNITY SOCCER PROGRAM IN THE CITY , A SOCCER CLUB WE CAN ALL BE PROUD TO REPRESENT AND GROW FOR THE FUTURE OF OUR KIDS AND PERHAPS OUR GRANDCHILDREN.